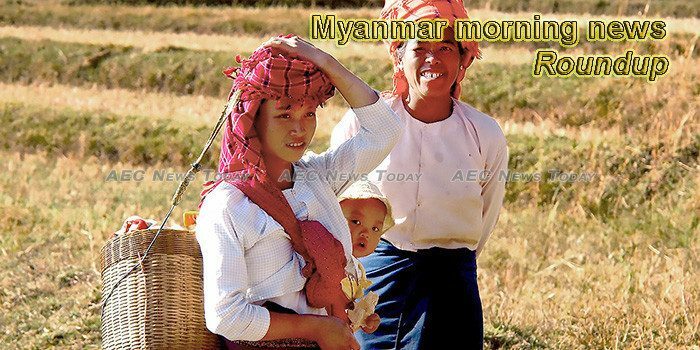 A positive forecast and outlook in terms of recovery of Myanmar’s economy is presented by a Singapore based macro economic surveillance agency, ASEAN+3 Macroeconomic Research Office (AMRO) for the coming two years. A spokesperson of the opposition Union Solidarity and Development Party (USDP) has told local media that arresting and suing journalists under Section 505 (b) of Myanmar’s Penal Code for their news stories breach far beyond democratic standards. Several thousand pro-military and nationalist demonstrators marched through Yangon on Sunday, voicing their support for Myanmar’s armed forces and government while condemning foreign involvement in the country’s affairs. The Rohingya living in the only camp for them in West Bengal have started to leave out of fear of crackdown by government agencies. According to Scenic Aura’s Captain Aung Na, navigating the sluggish Irrawaddy on its 540-kilometre journey from Pyay to Mandalay is somewhat of a challenge, eight out of 10 in terms of difficulty, with shifting sand bars a constant threat. An ultra-nationalist monk — dubbed the “Buddhist Bin Laden” — on Sunday condemned the international community for their calls to bring Myanmar’s generals to justice over the Rohingya crisis. In India, the first-ever deportation of Rohingyas to Myanmar has raised the specter of more repatriations among the 40,000 Rohingyas living in the country as the Hindu nationalist government takes a tougher stand on illegal immigrants. Three Myanmar nationals, including a husband and wife, were found dead after being buried alive when a landslide destroyed their rumah kongsi (shared house) at Batu 49, Kuala Terla, in Cameron Highlands on Sunday (Oct 14). Tensions at the diplomatic front between Bangladesh and Myanmar had escalated last Saturday after Myanmar ambassador U. Lwin Oo was summoned by the Bangladesh government to explain why St. Martin’s, an island in the Bay of Bengal was shown as part of Myanmar in two of its government’s websites. Over 180 brands from 8 countries and regions will be showcased at the largest tradeshow for numerous specific industrial sectors in Myanmar! Welcome to Dateline Irrawaddy! It is fair to say that Myanmar’s relations with Western countries have soured since the Rakhine crisis broke out. Bangladeshi Prime Minister Sheikh Hasina this month will open a refugee housing complex on a flood-prone island in the Bay of Bengal, with officials saying it is ready to accommodate 25,000 Rohingya from Myanmar who are sheltering in southeastern Bangladesh. At their 9th annual joint bilateral meeting in Nay Pyi Taw in August, both countries proclaimed from now on they are “natural strategic partners”. It was the right time, coming on their 70th anniversary of establishing diplomatic relations. The lack of talent in artificial intelligence will no longer be an issue in the near future, as Huawei Technologies Co will invest more than US$140 million in AI talent education in cooperation with universities and scientific research institutes, said on Friday ZhengYelai, the firm’s vice president and president of cloud business unit, at Huawei Connect 2018 held in Shanghai. The United Nations special envoy to Myanmar met with State Counselor Aung San Suu Kyi in Naypyidaw on Friday to discuss the Rohingya crisis in beleaguered Rakhine state, where the repatriation of some of the 720,000 Muslim refugees who fled to Bangladesh last year during a crackdown has yet to get fully under way. An investigation into currency market manipulation briefly focused on Telenor and Ooredoo, a law enforcement official has confirmed, after the mobile operators both purchased large amounts of US dollars. Some residents of Rakhine villages located in upper Kaladan River in Paletwa Township, Chin State at India border are preparing to leave due to food shortage. Jade export earnings reached US$402 million in the six-month mini budget period from April to September this year, exceeding US$196 million compared to the same period of last year, according to the Ministry of Commerce. The Lahu Women’s Organization (LWO), the Pa-O Women’s Union (PWU), the Shan Women’s Action Network (SWAN) and the Ta’ang Women’s Organization (TWO) pointed out in the statement that “despite the signing of the Nationwide Ceasefire Agreement (NCA)” between the government and some ethnic armed groups, conflict has increased in Shan State. Subsequently, there has been an increase in human rights abuses, interethnic conflict and internal displacement. The Union Budget Law for 2018-2019 which includes the government’s income and expenditure estimates has been approved by the Pyidaungsu Hluttaw. The government originally proposed that the summit be held near Mt. Popa in Kyaukpadaung Township, Mandalay Region, but EAO leaders asked that it take place in Yangon, before it was decided that it would be hosted in Naypyidaw. Cabinet Ministers of the Rakhine State government presented their demand to Vice-President Henry Van Thio on October 12 to reduce the half of the central government power and delegate this power to the state government. BRITAIN HAS cited the crisis over Rakhine State for a decision to suspend funding for Myanmar’s effort to join a European Union initiative aimed at combatting illegal logging and promoting effective forest governance. Sembcorp Industries’ US$300 million gas-fired power plant in Myingyan, Mandalay commenced full commercial operations on Wednesday following its first phase of operations in May. The summit between government, military and ethnic armed organizations that are signatories to the nationwide ceasefire agreement (NCA), previously set to take place in the Poppa region, will be held in Nay Pyi Taw, the Peace Process Steering Team (PPST) decided in a meeting. The humanitarian community – including senior UN officials – have expressed serious concern over government plans to close camps for displaced Muslims in Rakhine State and allegedly replace them with permanent shelters, with some warning that the process appears to reflect “a policy of apartheid”. Myanmar sits at a strategic crossroads of Asia, connecting the Indian sub-continent with East and Southeast Asia. It stands to be a meeting point for the various peoples of Asia, linking shared cultures, history and values. Robert Garverick, Minister Counsellor, Embassy of United States of America (New Delhi) put forward his observations after visiting the Indo-Myanmar Border town Moreh conveying that infrastructure development is a must to attract more investors in the region. Myanmar government and the nationwide ceasefire accord (NCA)-signatory ethnic armed organizations (EAO) have held a preliminary meeting in Nay Pyi Taw ahead of a trilateral peace talks, the official Global New Light of Myanmar reported Sunday. The Rohingya Muslims have suffered racial discrimination for decades in Myanmar. They are gunned down, their villages are burnt, crops destroyed, babies thrown into fire and ,girls and women raped. BRUNEI Darussalam agrees to advance its cooperation in rice production with Myanmar following the signing of a Memorandum of Understanding (MoU) for agriculture sector cooperation that is hoped to boost Brunei’s rice production. Zin Min Tun (R) of Myanmar competes during a friendly match against Bolivia at the Thuwana stadium in Yangon, Myanmar, Oct. 13, 2018. Myanmar lost 0-3. Pohl said DW was working to inform the world about the everyday life of the refugees.